First class, high quality stator restoration you can rely on, year after year. All wiring materials used have ratings that SIGNIFICANTLY exceed original equipment specs. Additional windings on exciter coil provide improved starting, idle and off the line performance. The three common modes of failure for this family of stators has been eliminated in our special winding, termination and epoxy saturation process. To be a candidate for restoration, the stator must be OEM Kawasaki, have NO damage to the battery charging coils portion. If you are in doubt, please send a photograph for evaluation Crank position sensor replacement not included. 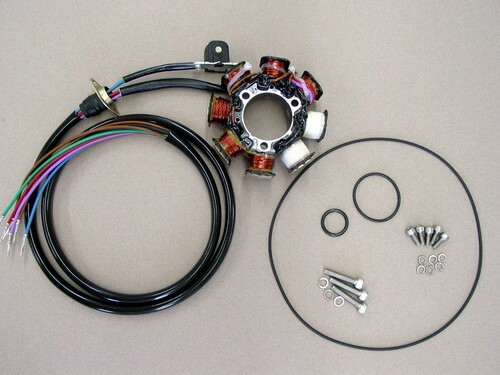 New hardware, cover O ring, inspection cap O ring and electric box O ring are included to properly install your stator. BE CERTAIN to clean hardware and all female threaded holes with suitable degreaser and use red Loctite.